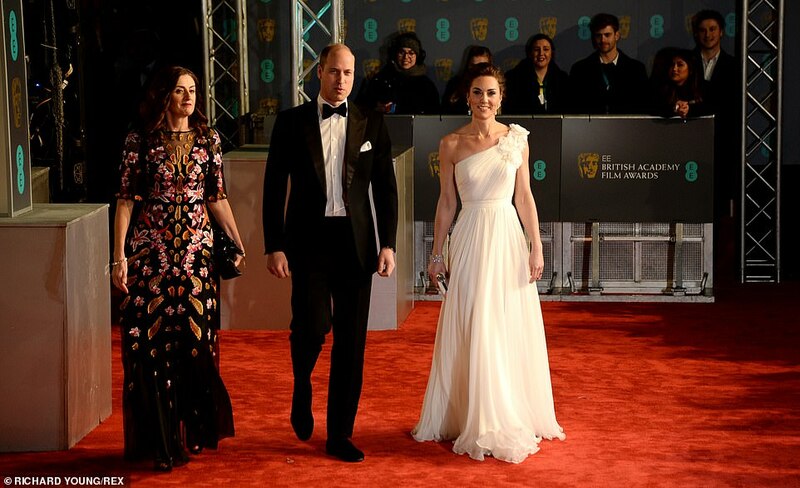 The Duchess of Cambridge stole the show in Alexander McQueen last night as she joined a host of stars at the Baftas for the third year running. 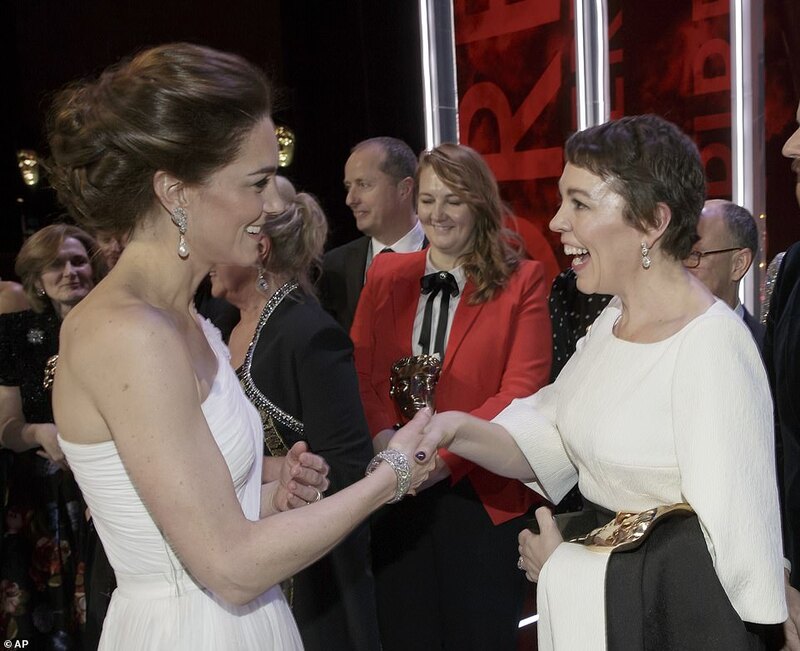 Kate, 37, came face-to-face with acting royalty as she caught up with Olivia Colman, who won Best Actress for her portrayal as Queen Anne in The Favourite, and co-star Rachel Weisz, who picked up Best Supporting Actress. 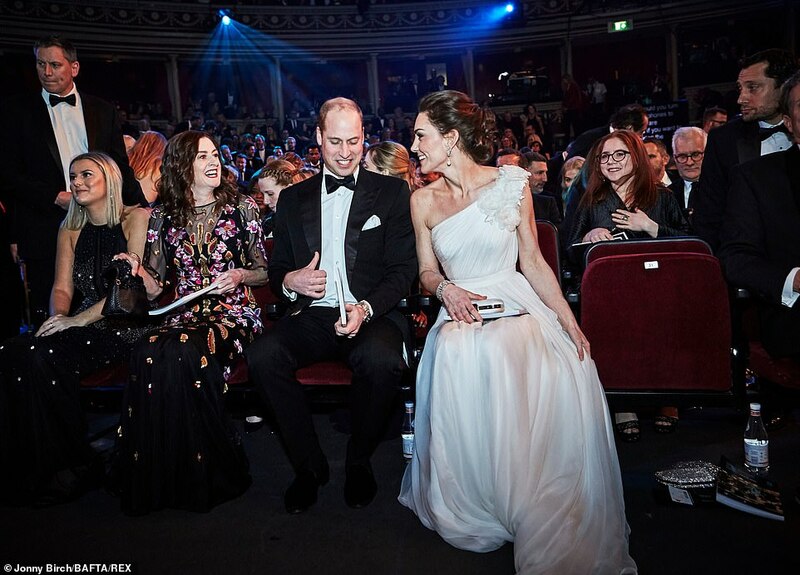 Looking every inch the film star alongside her husband Prince William, Kate teamed her billowing chiffon gown – from the label behind her 2011 wedding dress – with a pair of shimmering £525 Jimmy Choo glitter heels. In a fitting tribute to Princess Diana, the duchess is believed to have worn the same South Sea Pearl accessories debuted by William’s mother to a concert at the Royal Albert Hall in 1991. 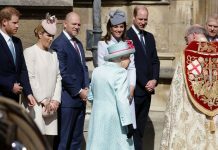 And adding an extra dose of glitz to her glamorous cinched-waist ensemble, Kate topped off her look with the Queen’s Quatrefoil bracelet, which once belonged to the monarch’s mother. 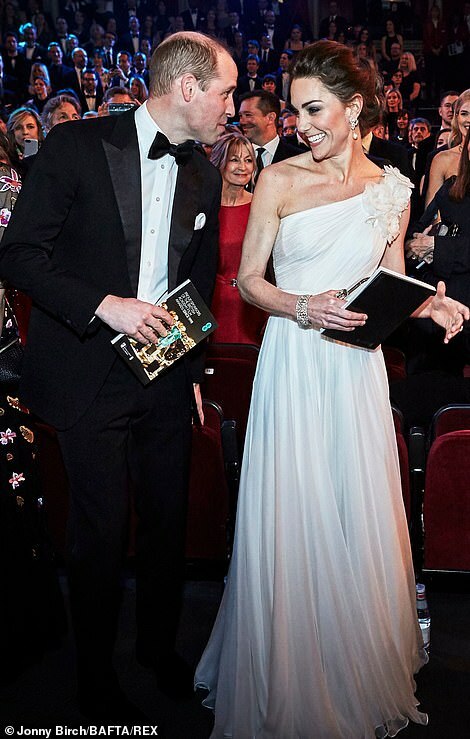 Holding a small white clutch, the mother-of-three sported glamorous makeup with a pink lipstick and a dark smokey eye as she beamed for the cameras at the 72nd annual EE British Academy Film Awards at London’s Royal Albert Hall on Sunday. 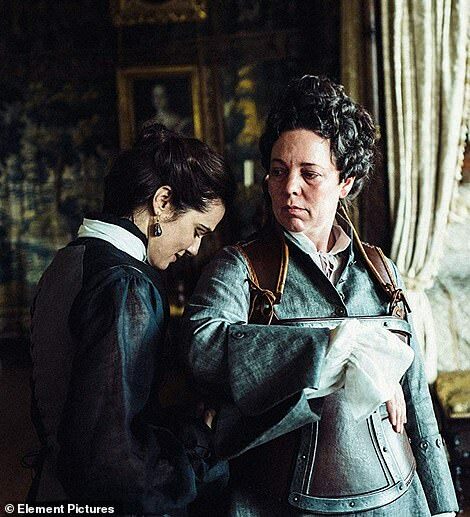 The British blockbuster, which swept the board with seven gongs, is set in early 18th century England, and tells the story of a frail Queen Anne, who occupies the throne and her close friend, Lady Sarah, who governs the country in her stead, until a new servant, Abigail, (Emma Stone) arrives and her charm endears her to Sarah. 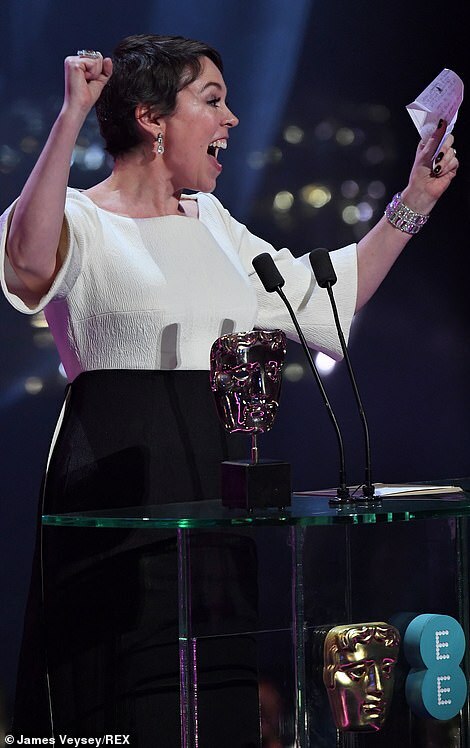 Miss Colman, who is currently filming for her role as the current Queen Elizabeth II in The Crown, fought back tears as she accepted her Bafta last night. 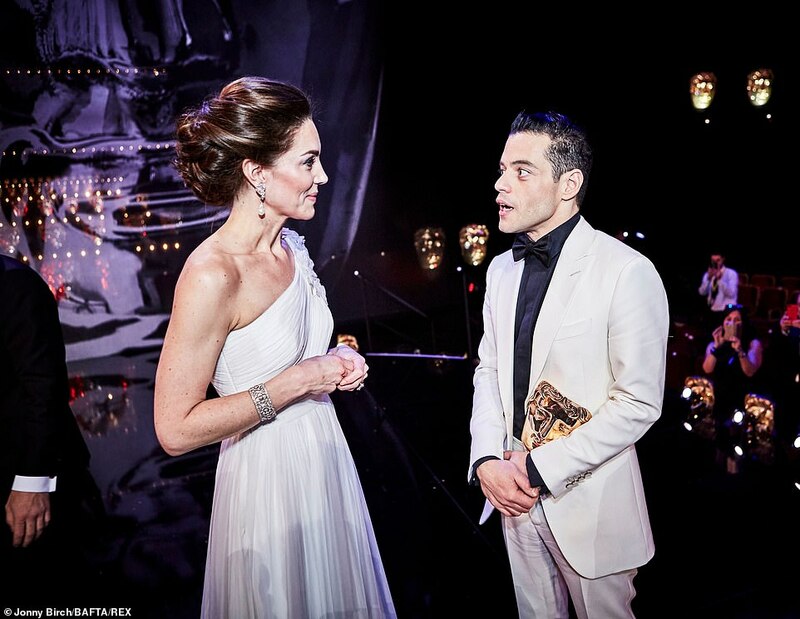 The 45-year-old thanked her co-stars, and said: ‘Thanks so much, it’s really big. I do know what to say, I’ve actually written something down. 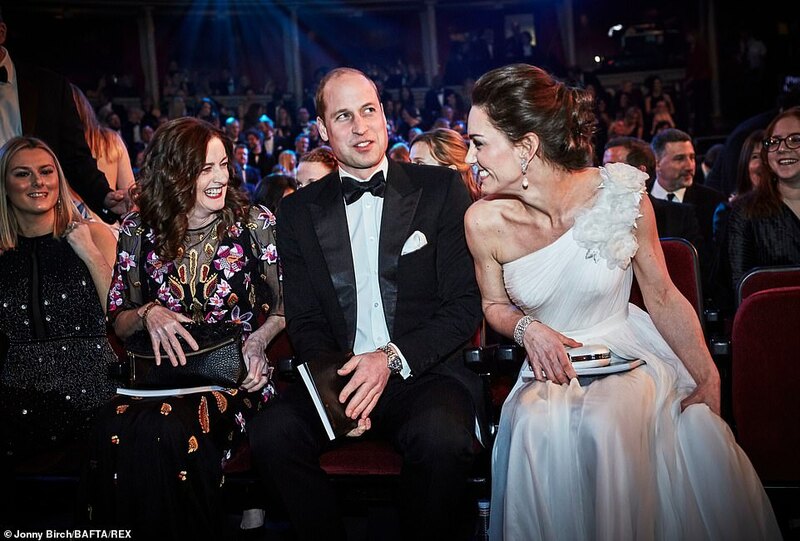 To my fellow nominees, to be in the same company as you is an extraordinary honour. 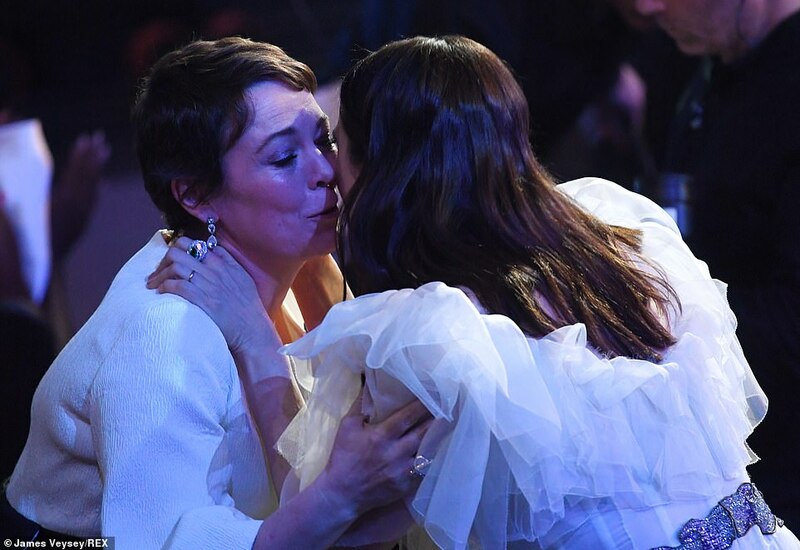 She added: ‘Emma and Rachel – I must keep it together – for your performances and what you did after the camera stopped rolling. We’ve never talked about this and I find it very emotional, but I love you. 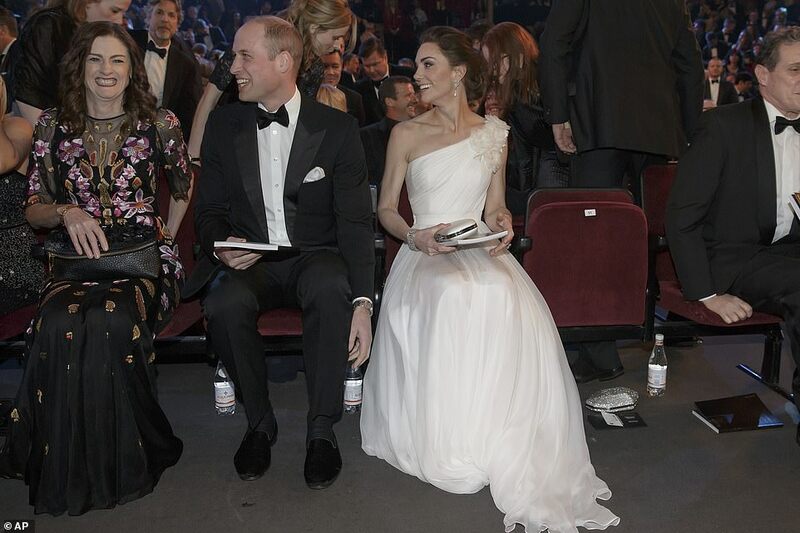 The awards were attended by the Duke and Duchess of Cambridge, with the latter outshining many of the actresses in a sweeping, one-shoulder ivory chiffon gown by Alexander McQueen, the same design house who made her wedding dress. 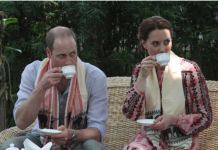 She also wore a pair of dazzling pearl earrings that belonged to Princess Diana. 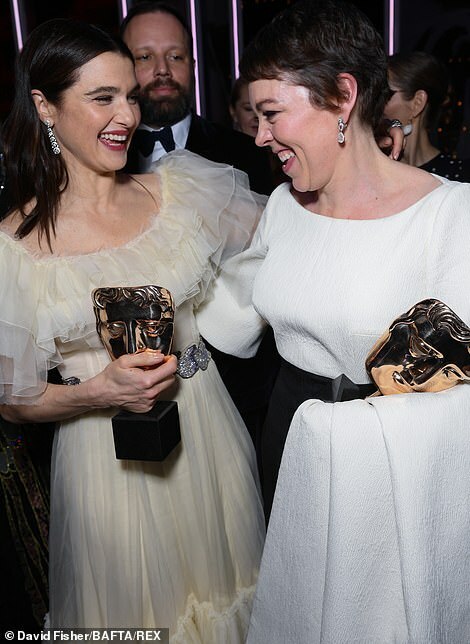 Rachel Weisz, 48, who won the Bafta for Best Supporting Actress in The favourite, paid tribute to her co-stars, saying: ‘Olivia Colman, Emma Stone, need I say more? 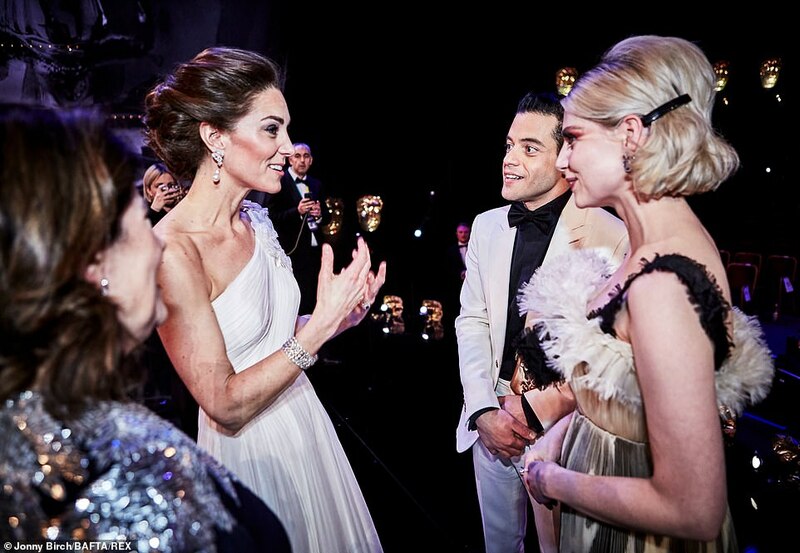 The Duke of Cambridge, who is the president of BAFTA and donned a black dinner suit for the star-studded occasion, presented its highest accolade, the Fellowship, to film editor Thelma Schoonmaker during the ceremony. 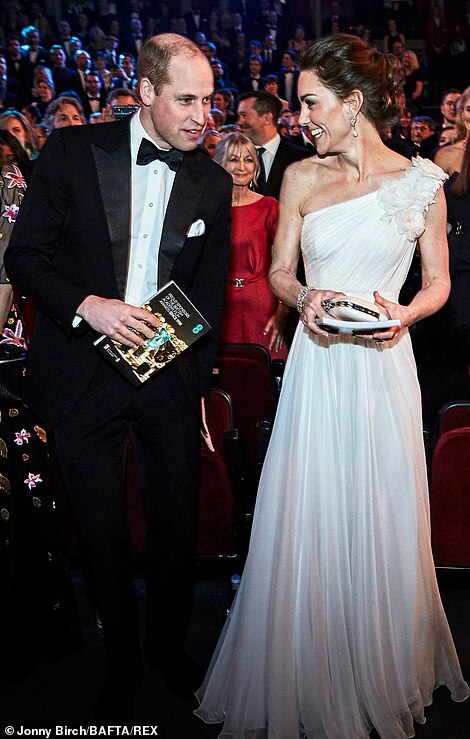 Upon arrival, the royal couple were greeted at the entrance by the Royal Albert Hall’s chief executive Craig Hassall before making their way to their seats, with the entire crowd getting to their feet to welcome them into the ceremony, which was presented by Joanna Lumley. 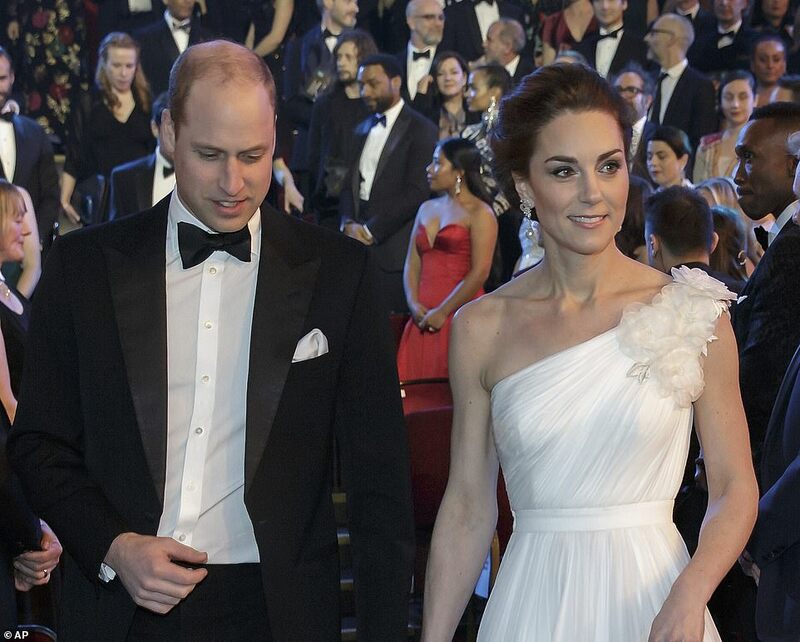 At the end of the Awards, guests were told to remain in their seats while the royal party left and the Duchess sweetly offered an apology for keeping everyone waiting – and even sent Hollywood actor Bradley Cooper a cute grin – as she walked back up the stairs, a MailOnline source exclusively revealed. 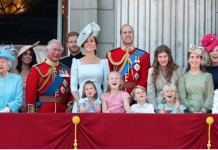 Meanwhile, the single mother, Karen Anvil, 40, from Norfolk, who took the now-famous photo of the ‘fab four’ (Kate and William along with the Duke and Duchess of Sussex) on Christmas Day last year at Sandringham, has done it again. 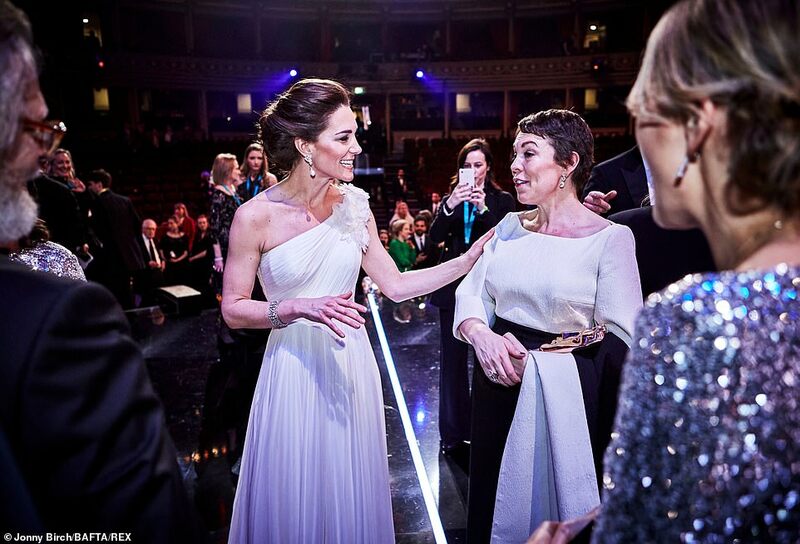 This time she captured the shot with the help of her daughter who snapped the Duchess of Cambridge with a beaming smile on her face at the ceremony. 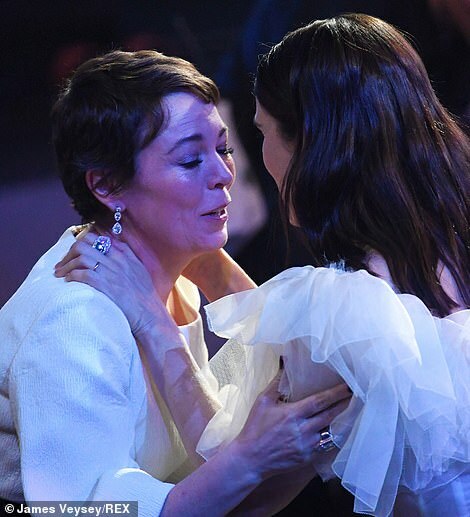 Elsewhere, Olivia Colman veered away from royal demeanour in her emotional acceptance speech at the Royal Albert Hall as she promised ‘to get so p*‘ with a few celebratory drinks. 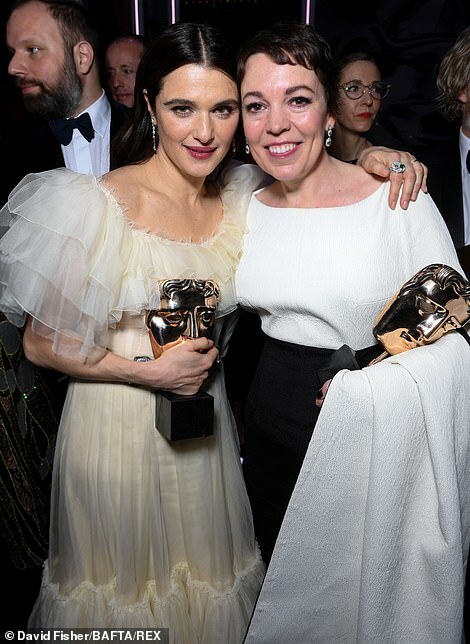 Her film about the eccentric 18th century British monarch, which now seems bound for Oscars glory, was beaten to the best film prize by Mexican drama Roma. 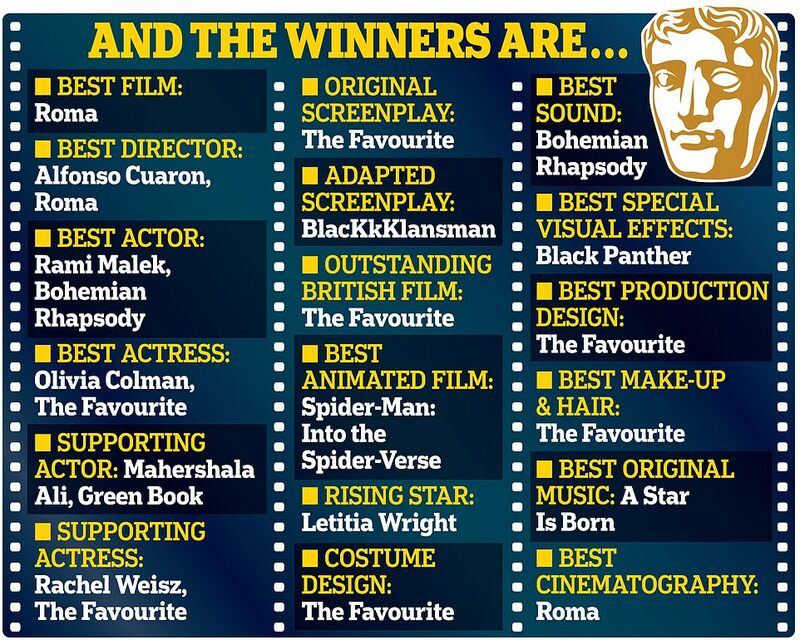 But it picked up plenty of other awards for outstanding British film, original screenplay, costume design, production design and hair and make-up, while Miss Colman’s British co-star Rachel Weisz was best supporting actress. 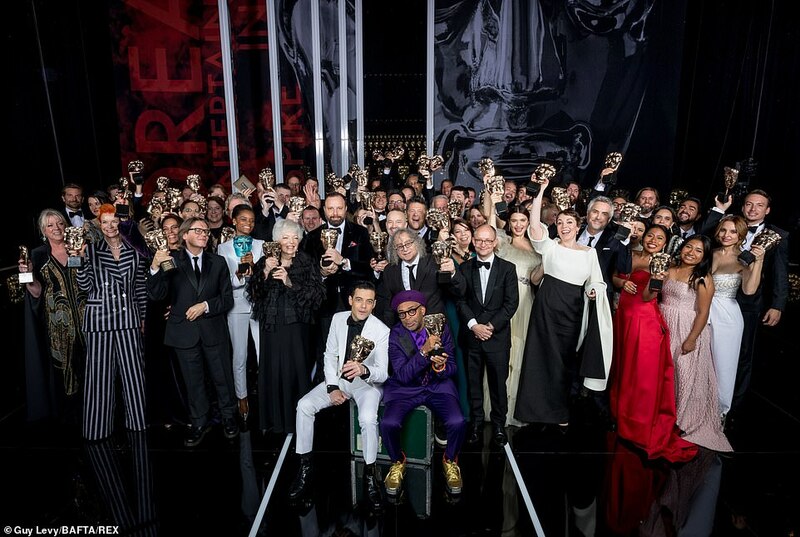 Netflix drama Roma took home the top prize at the awards ceremony at London’s Royal Albert Hall, pipping other nominees BlacKkKlansman, The Favourite, Green Book and A Star Is Born to the post. 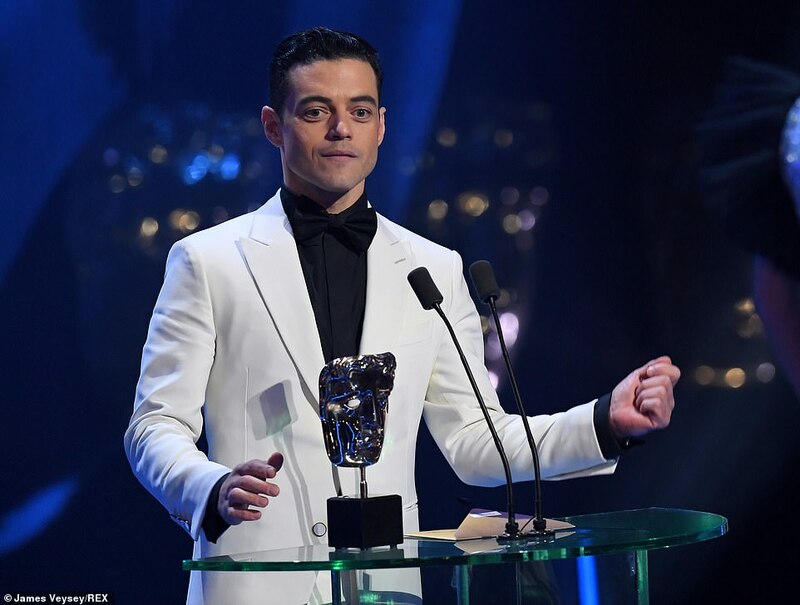 Spiderman: Into the Spiderverse, which has previously done well at earlier awards ceremonies, was given the Best Animation accolade at the glitzy awards ceremony. Joining the A-lister display for the ceremony, Cate Blanchett wowed in a perilously low-cut black dress with a jewel-encrusted bodice, while debuting her newly-dyed brunette locks. Upping the fashion ante, the screen star took the plunge as she went braless in the sizzling gown, while flashing a hint of her lean legs with the ensemble’s thigh-high slit. Switching up her signature look, natural blonde Cate styled her newly-dyed brunette tresses in a sleek blowdry. The Aussie star complemented her out-of-this-world beauty with rose-tinted eyeshadow, blush-swept cheeks and pale pink lip gloss. 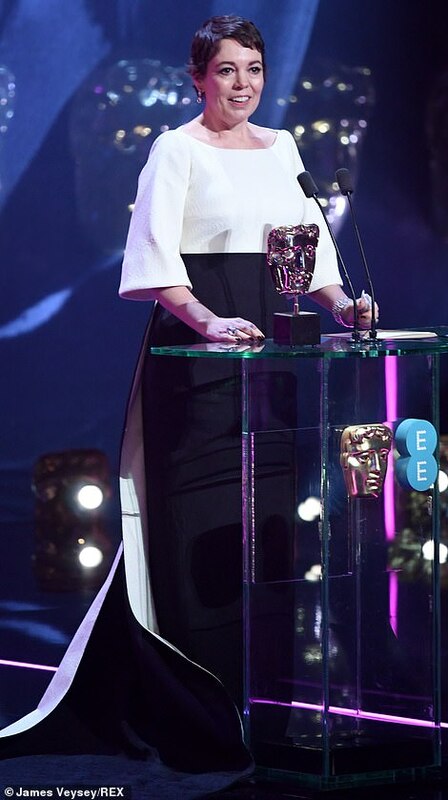 The Present star added height to her enviable physique in a pair of classic pointed heels, while accessorising with an array of statement rings. 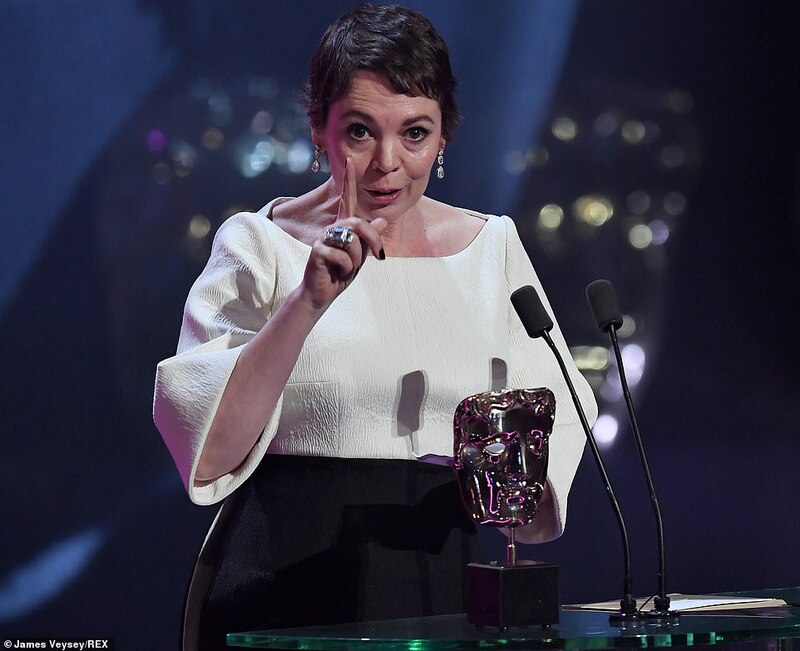 Olivia Colman looked elegant in a chic monochrome number, with her top half being white and flaring out into a form-flattering black dress. 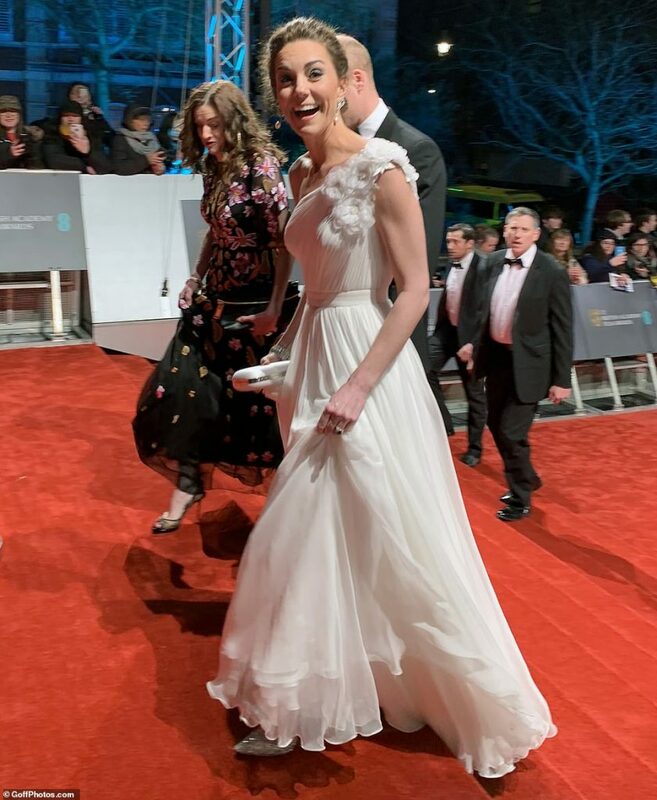 The British actress, 45, who is taking award season by storm, looked like she was having the time of her life as she posed away on the red carpet. Olivia sported a contoured make-up look while her short brunette locks showed off her silver earrings. 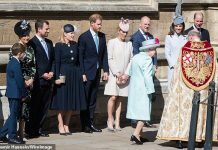 Also joining the royals at the occasion was Eleanor Tomlinson, who showed off her style credentials in a sensational baby pink number which featured an asymmetrical neckline, complete with a statement bow. 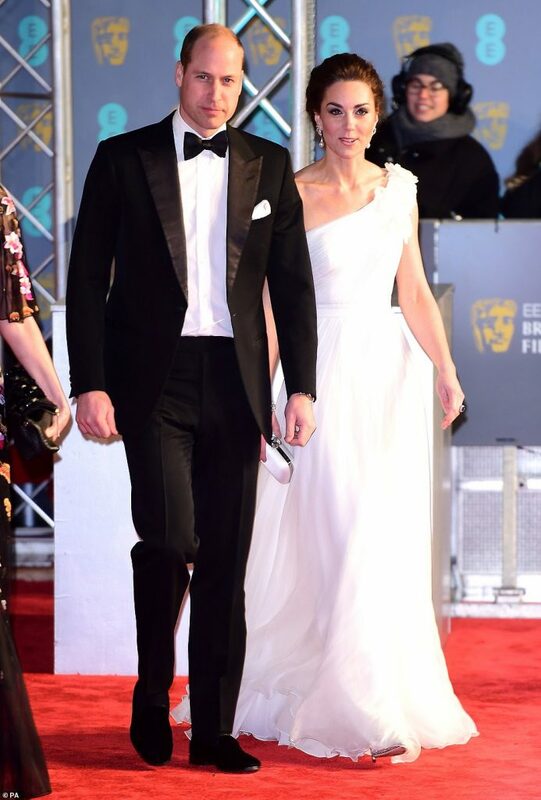 The Poldark beauty oozed glamour in the piece which featured extensive embellished detailing down one side, while the other was laden with black satin. Meanwhile, Rachel Weiz wowed in a cream dress as she toted her belongings in a shiny gold clutch. 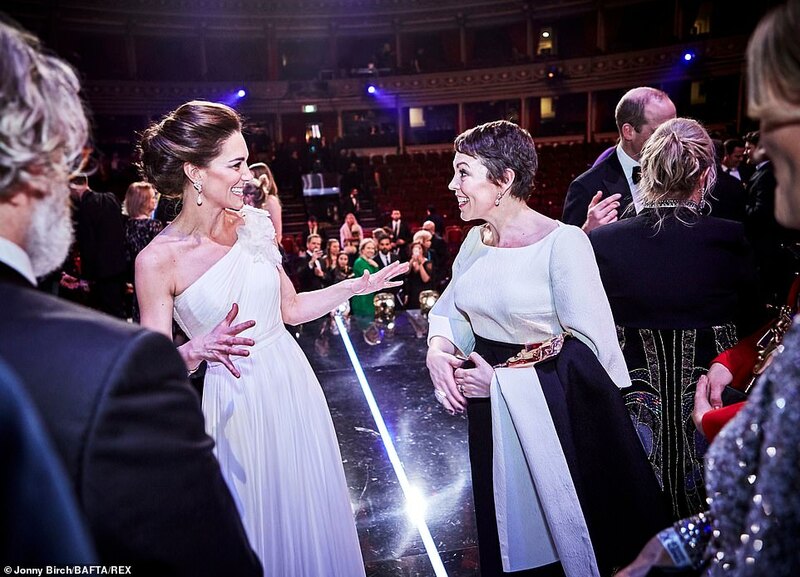 The 48-year-old worked the red carpet in the sensational number which boasted an eye-catching frothy neckline.